Just in case you need someplace to stash your butterfly knife. So Southern Son and I noticed some things about London. One of them being a garbage can is hard to find. You would think this stunning city would be drowning in a sea of litter, but no. I think we noticed it after a time or two of having to tote an empty soda can or a scrap piece of food wrapping more than a few blocks, more than a few tube stops before we found someplace to get rid of the used item. In fact, someone I know (and I won't say who since the offense in question happened on his birthday) left an empty juice bottle on the ground along Portobello Road in Notting Hill. We quickly learned - either take your trash with you and hope to find the holy grail of trash receptacles along the way, or hand the scrap back to the person who sold it to you. That's what I did at either the Baker Street or Green Park station while making my way to Heathrow Tuesday. Now, Monday morning we noticed something that was not quite a trash bin, but something that was just as unusual a sight in London. D Money already told us - guns are verboten in London. Even the cops are sans semi-automatics. The police carry tasers to help defend against particularly aggressive criminals. 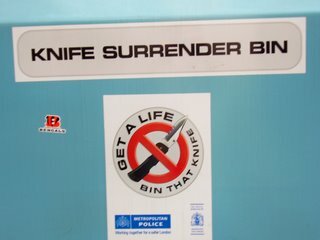 It turns out the knife is the chosen form of weaponry for those who want to unleash a crime wave in London, and these "knife surrender bins" are a method to encourage those criminals to put down the knife and pick up peace. Does the city wide CCTV (London's Big Brother security move to watch virtually every single person walking and breathing within the view of the cameras) capture images of these people who are dropping knives into the Knife Surrender Bin? 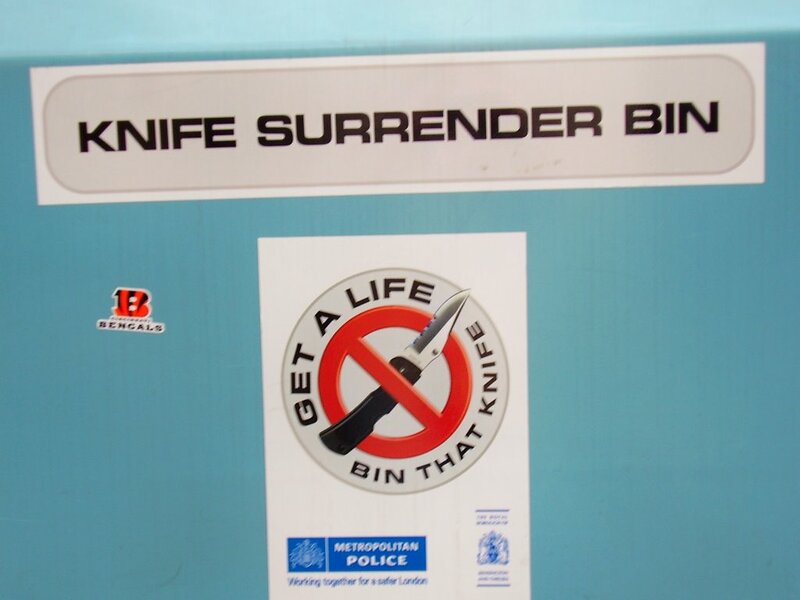 Do criminals try to break in to the Knife Surrender Bin to try and take advantage of the machetes and butchers knives just waiting to be used for a Jack The Ripper kind of crime? What does the government do with all this surrendered weaponry? I am almost certain some bad guys would try to break in if the police put a "Gun Surrender Bin" in Cincinnati's Over-the-Rhine. The first time I went there I never understood the no-trash-cans-in-the-subway-although-you-can-buy-candy-and-Coke-there thing. Then I remembered the IRA. Why is it posting me as my first name? This is spydrz by the way. Really weird. This is better. Sorry to thread-steal. The IRA - yes, my crazy Irish brethren can go a little hog wild with the bombings. Just keep the beer coming and everything will be okay. And Douglas/Spydrz - it's like discovering Superman is really Clark Kent. Don't worry, I'll keep your secret Doug, er, Spydrz.